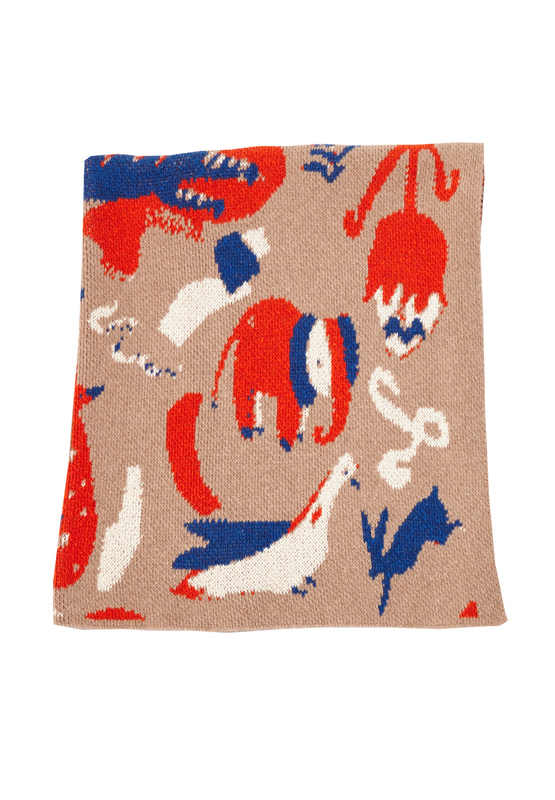 We were recently introduced to the whimsical baby blankets made by textile artist, Hillery Sproatt by Shop Merci Milo. Smitten with the folklore and colorful, childlike creatures in her work, we reached out to introduce ourselves. We were thrilled to learn the apple doesn't fall far from the tree while her mother is also a textile artist ! And so in our first Two Peas in a Pod series, we explore the familial inspirations and shared stories of their craft.. Click for more of the conversation between talented Mother & Daughter. Driven by her desire to make fine art functional, Hillery Sproatt translates her paintings into textiles. Her background in fine art coupled with the early influence of her mother, fiber artist and clothing designer Debra Weiss, fueled her love for pattern and textiles. We asked them a few of the same questions about their captivating work and growing up in a creative household. 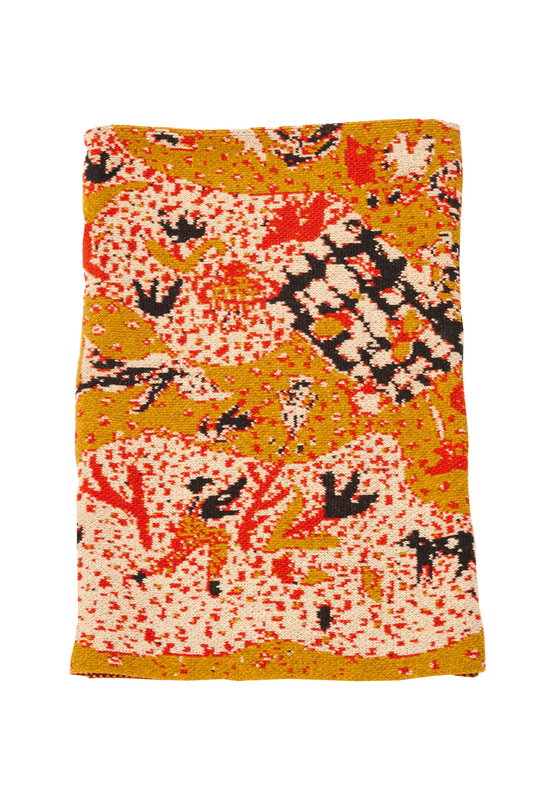 My Mom's playful and intuitive sense for color and material are endlessly inspiring as is her passion for textiles. Weavings adorn her studio windows, hand-stitched cloth can be found pinned to her walls and there is always a work in progress and heaps of braided material overflowing in baskets littering the floor. Her vibrant home functions as her studio, so you brush past her collection of beautiful garments on the way to her kitchen, which smells sweet with whatever she’s cooking at the moment. I’m always ogling something when I’m in her space. Hillery is a fine artist and an excellent craftsman. Her paintings transport you to another world revealing many individual happenings within a whole piece. They touch my soul. She is also gifted at arranging. She can set an object in place at just the right angle to make it alter a room. Her textile works are beautifully designed and executed, and her current ceramic work, with little paintings on clay, bring a smile to your face. It is a joy to live with her functional art pieces in your home. To say the least I am very proud and inspired by her. PS: Could you tell us about the beginning of your artistic collaboration? HS: I made small dolls, little books and drawings for as long as I can remember. As a child, making things created a quite space for me to imagine worlds entirely my own. My process today remains very intuitive. Perhaps it’s the surprise of seeing something into existence that excites me or quieting my mind a bit and letting my hands do the talking, either way making things has always felt right. When I was 15, my Mom started Rebe. We co-designed many of our first pieces together as neither of us truly new what we were doing. We played off each other’s strengths. My mom was good at jumping in and I was good with the details once we were knee deep in a project. It was fun and challenging, but we both learned a great deal. DW: I started my business when I saw Hillery's ability to draw and paint on paper. For me, I was only able to create in three dimensions. Together. we would look at books, textiles and nature to see what excited us. From there I began to create functional wear. HS: One of my Mom’s greatest desires as a single mother of three girls, was to raise us with the courage to follow our dreams. In respect to my current art practice, I have my mom to thank for her endless support and encouragement. PS: DW, what small notions were successful in fostering creativity in childhood, or did you do anything to make art “stick” in your home? DW: Growing up, everyone in my family was always making something as hobby, whether is be cooking, sewing, woodwork or jewelry. I tried to maintain this exposure to material, craft and play in my home when raising my three daughters. PS: Both: You could not create without....... ? HS: I am very sensitive to my space. I enjoy working in a space that is clean, tidy and full of natural light. Having order around me allows me to relax into the work. DW: I will always create. It keeps me happy. When my children were young I worked full time in the medical field. I didn’t have the time for a studio practice, so I created in the form of cooking and baking as eating was something that nourished us and brought us great joy. I still treat cooking as a creative expression. PS: What’s next for you? 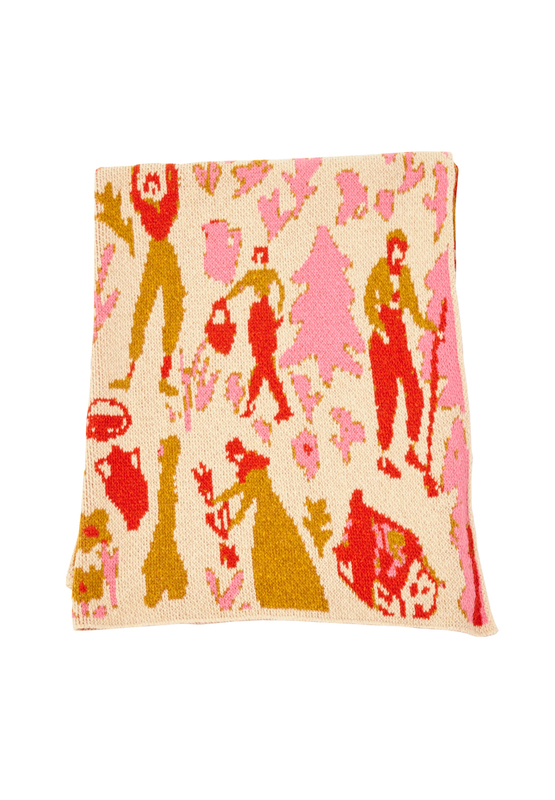 HS: I plan to expand my collection of knit blankets, to begin showing my paintings and I hope to take on more textile collaborations in the very near future. Busying myself with my work feels wonderful. DW: I am looking forward to continuing to grow my line, Rebe by Debra Weiss, which I design for our online shop Specks & Keepings. I would love to begin showing my fiber work. I am starting to keep my eyes peeled for a studio space that allows me to build large fabric works and instillations that for now only live in my imagination. *Watch this space for more conversations between two creatives pairs! !